This is the translation of the Dutch text on this little index card (pardon the fuzzy picture; I would have made a horrible spy) that has been on the bulletin board at my local supermarket for quite a while now. Sometimes I go over to the board just to look at it, surreptitiously, pretending I’m also looking at the other cards offering bicycles, kids’ toys, clothes or a variety of other things people no longer want or need. Or services they are offering, such as cleaning, odd jobs, or housepainting. But all I’m really interested in is this little red card. 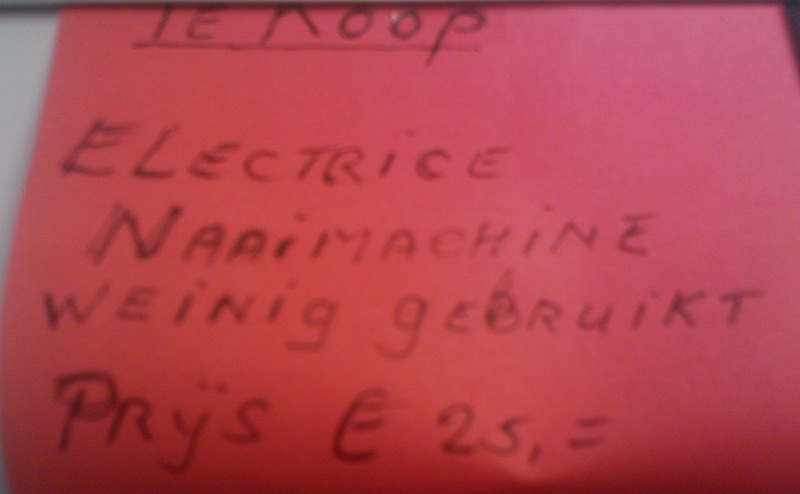 Apart from the fact that the Dutch is incorrectly spelled (electrice being the phonetic way of writing the correct word, electrisch), I have to wonder what the story is behind this card, who the person is who put it there, hopeful that he or she would quickly find a buyer. I fantasize about it being an elderly woman, a member of the generation that not only experienced World War II as young children or teenagers, but survived it. A generation of women (if it was a woman) who never finished secondary or high school, many of whom didn’t even get all the way through primary school. After all, school wasn’t considered as important as staying home and helping their mothers take care of the other 6, 7, 8 or even more younger siblings. Some of them even had to go to work at a young age to help the family make ends meet, particularly if the father and/or brothers were off at the front, or prisoners in a work camp in Germany. In the 1940s but more commonly in the 1950s, most girls went to huishoudschool or “domestic science school”, where they learned how to, you guessed it, be housewives. Their brothers went on to learn a trade or profession (so presumably, they could be good husbands). Those who had made it home safely from the battlefields, that is. Maybe it had belonged to a woman who could no longer see well enough to sew, or whose hands were failing her. Whose daughter or granddaughter had no interest in such an old-fashioned hobby. Perhaps the person who wrote the card was not even necessarily part of the “war generation”. It might, in fact, have been pinned there by a man, a widower who is slowly, sadly packing up his wife’s things, removing any reminders of her, particularly those that may be worth something, easy to sell for cash. After all, young families and students fresh out of college (the jobs available for them these days are fewer and farther between) are not the only ones feeling the effects of the economic crisis here. Many of the elderly have had to suffer major cuts in their already meager pensions, or the full retirement benefits they are still fortunate enough to receive don’t go as far as they used to to cover the ever-rising cost of living these days. Or maybe I’m romanticizing it. Maybe it’s just a foreigner like me who hasn’t mastered written Dutch yet. Or a native speaker who can’t spell, or who just doesn’t care about these things. Or someone else entirely. Still, I can’t help but wonder.